Peter Ludlow, uno dei maggiori filosofi della tecnologia, insegna filosofia nella Northwestern University (Illinois, USA) ed è stato tra i primi a teorizzare il concetto del cyberspazio e dei suoi diritti. E uscito, nel ottobre 2010, il suo nuovo saggio (in formato elettronico) Il nostro futuro nei mondi virtuali (40k Books). 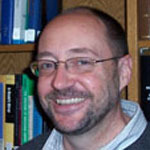 Peter Ludlow is professor of philosophy at Northwestern University in Illinois, USA. He has also established a research program outside of philosophy and linguistics. Here, his research areas include conceptual issues in cyberspace, particularly questions about cyber rights and the emergence of laws and governance structures in and for virtual communities. His popular books include High Noon on the Electronic Frontier (1996) and Crypto Anarchy, Cyberstates, and Pirate Utopias (2001). He is also the co-author (with journalist Mark Wallace) of The Second Life Herald: The Virtual Tabloid that Witnessed the Dawn of the Metaverse (2007) on his career as a virtual world journalist. His professional books include Semantics, Tense and Time: an Essay in the Metaphysics of Natural Language (1999). Ludlow studied with Noam Chomsky at MIT but received his PhD in philosophy from Columbia University in 1985 under the direction of Charles Parsons. His dissertation was on the syntax and semantics of referential attitude reports.